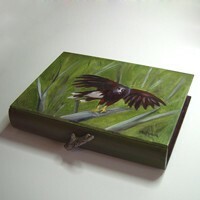 I first painted one of these boxes as a donated art project for the annual Philip J Steele Foundation Art Bash which is an auction to raise funds for scholarships for art students currently in or seeking a college education. 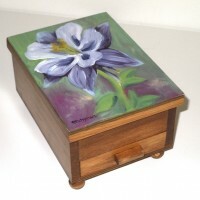 My friends and family started wanting a box for themselves or as a gift and through encouragement from them, I began painting more of them as commissioned works. 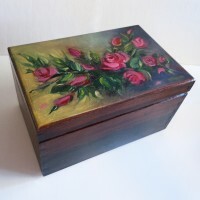 The process begins with sanding the box, then a coating of PVA size is applied to protect the painting from the acids in the wood. 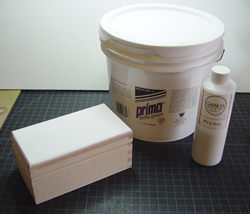 I then coat the surface with several layers of gesso, sanding in between. Once the surface is dry, the image is first painted in oils as an underpainting, followed by the final painting, air dried and coated with varnish for protection. 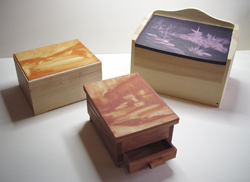 The inside and outside of the painted box is stained and coated with a layer of poly. 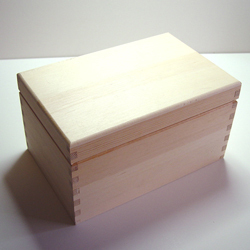 Some boxes have added charms, sticks, lures, fishing flies, or other ornaments added to complete the theme. 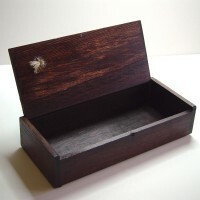 There are several sizes and shapes to choose from. 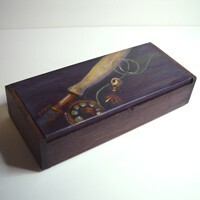 Please write or call me if you are interested in having me paint a box for you!